Guys! 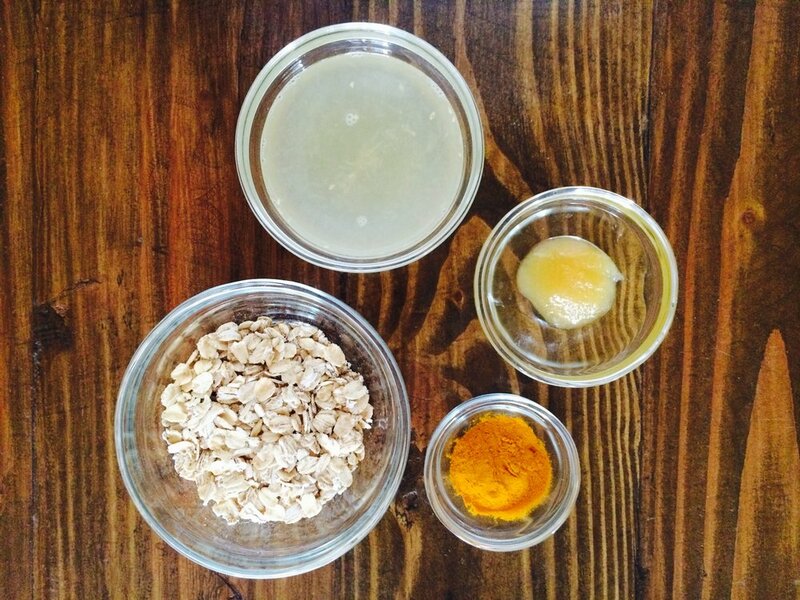 Today is #nationaloatmealday (yes, the kids say that this is a thing)...AND it's almost Halloween ~ what a better day to make my Oatmeal, Grapefruit, Honey & Tumeric Facemask! Who needs to spend tons of cash on overpriced, store bought facial remedies when our kitchens are filled with tons of unique, all-natural, nutrient packed ingredients that will leave our skin feeling fresh and looking oh-so vibrant?! Ingredients: Oatmeal: With anti-inflammatory and antioxidant properties oatmeal helps soothes itchy, dry and irritated skin and absorbs excess oil from the skin's outer layer. It also works as an exfoliant and acts gently on all skin types which makes it a great base for any DIY facial mask. Grapefruit: The rich vitamins and retinol antioxidants within a grapefruit repair damaged skin which slow down the development of fine lines and acne while evening skin tone and removing toxins. Grapefruits also promote the production of collagen, making your skin more plump...younger looking skin, yes please! Because of its high water content, this fruit will hydrate your skin and provide a smooth texture and a youthful glow. Honey: Loaded with antibacterial and antiseptic properties, honey makes for a good skin cleanser as it soaks up impurities from your pores leaving you with glowy skin. Honey also retains moisture making your skin radiant and soft. The antioxidants in honey also help to protect your skin from UV ray damage and assist the skin to rejuvenate and stay young while preventing wrinkles. When honey is combined with turmeric powder it helps in a natural skin lightning process. If used over time, it can be great for those with red or rosacea prone skin (me!!) and can reduce skin blemishes and scars. Turmeric: This golden root reduces inflammation and redness and promotes skin healing which also makes it super effective in treating rosacea and brightening the skin. Turmeric contains a photochemical called curcumin that has been proven to help prevent diseases and cancers of the skin, and has been used to treat problematic skin conditions including psoriasis, vitilago, melanoma. It is jammed with antioxidant, anti-inflammatory and anti-bacterial properties that soften wrinkles, moisturize and naturally exfoliate your skin leaving it so fresh and so clean, clean! Directions: 1. Add 1/2 cup oatmeal, 1/4 cup grapefruit juice (half of a grapefruit), 1 teaspoon honey & 1 teaspoon turmeric powder into a food processor and blend for a good 30 seconds. *By blending all ingredients, you create a nice thick paste that stays put on your face versus falling off of your face like Mrs. Doubtfire in that scene where she has cake icing dripping all over the place. "Heeeeelllooooo!" 2. Tie your hair back and take your shirt off...yeehaw! *Turmeric is a natural dye so you don't want to get it on anything. 3. Wash your face with warm water to un-clog your skin pores and pat dry with a soft towel. 4. Apply a thick coat of this golden paste to your face with your fingertips using circular motions to promote blood circulation. *Try to apply under the eyes (without actually getting it in your eyes), as turmeric’s anti-inflammatory properties will help reduce dark circles. 5. Leave the mask on for 15-20 minutes. 6. Wash your face with a soft towel using cool water and no soap (this helps to close pores). If you have any of your creation leftover, you can save it in the fridge for a few days and use it on the reg...and/or scare your roomies!